Oh my goodness I’m excited and frightened all at once about the upcoming Self-Stitched-September ’11 project, started by the fantastic Zoe of http://sozowhatdoyouknow.blogspot.com. What I’m looking forward to most about SSS’11 is the opportunity to try out lots of styles and come up with different ways to accessorise/wear the same item. At least that’s what I aim to do – the reality may just be me in the same outfit seven times! We’ll see. 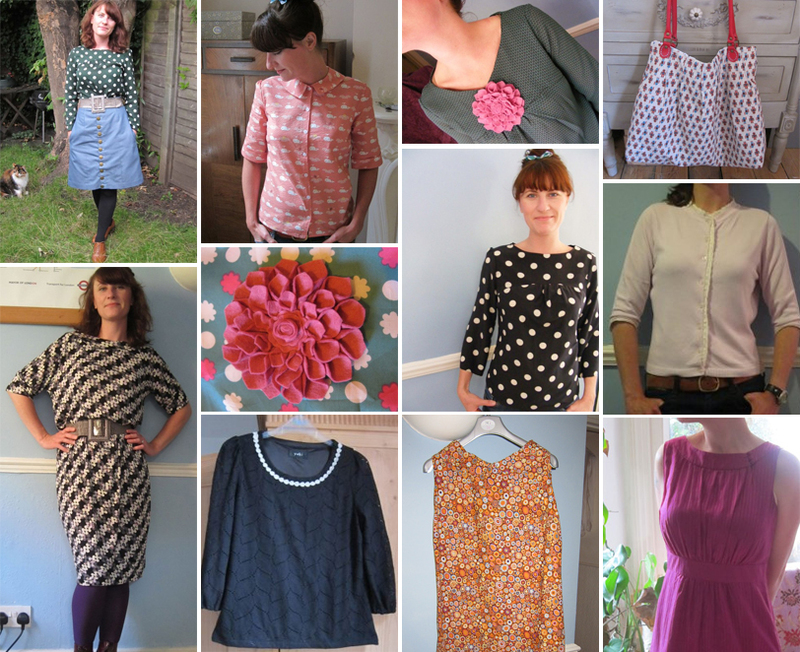 This isn’t my finite wardrobe though – I’m in the middle of a pair of PJs (hopefully I can reveal them this weekend) and as soon as I get some fabric I’ll be joining Casey’s circle skirt sewalong, as well as attempting a corduroy Beignet and perhaps churning out another smock top or two (I think they’ll come in very handy during SSS’11). What about you? Are you doing it? Have you had a panic attack at the thought yet? Let me know and we’ll hyperventilate together. Enough worrying though – I’d better get to bed early tonight – have a 7am conference call in the office tomorrow morning – ack! 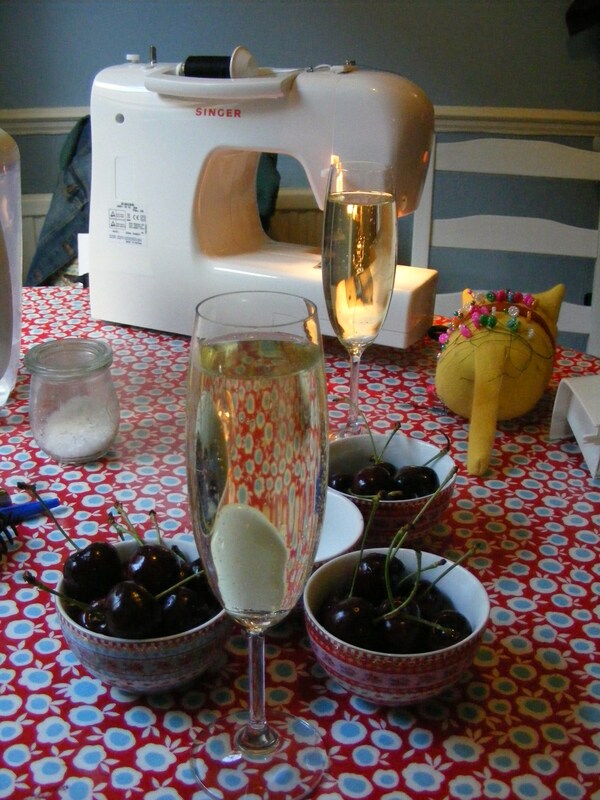 Cherries and cava – awesome combination. 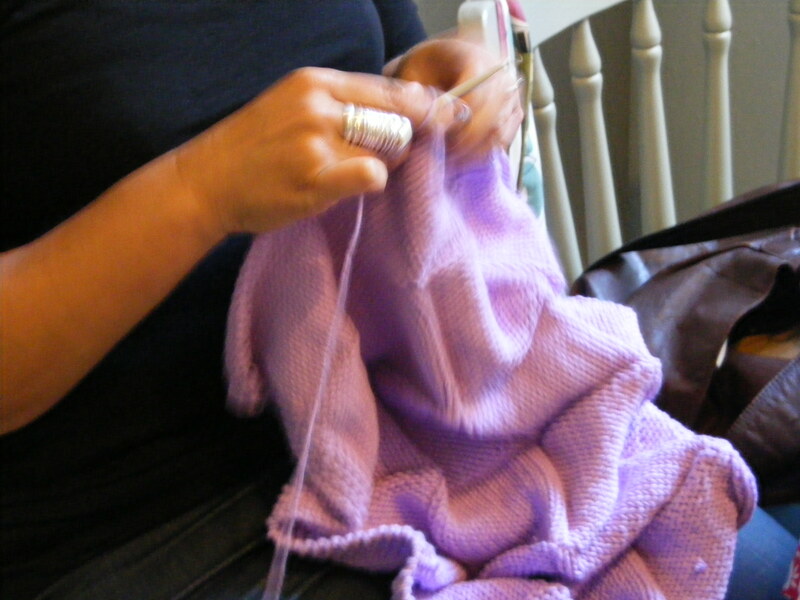 I tried to take a picture of Tanya knitting but her hands move so fast it ends up being a bit of a blur! I’ve been doing a bit of fabric stash busting too. 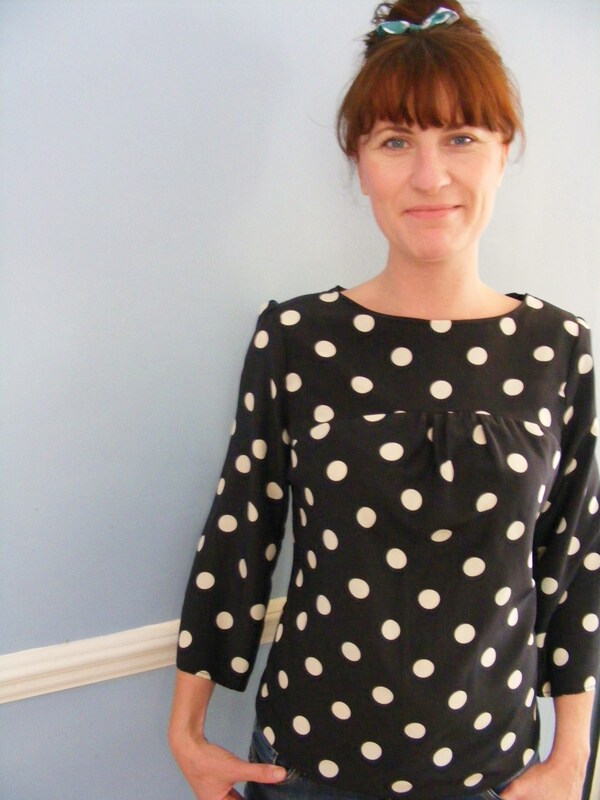 Remember this polka dot top from Zara? The original top has a zipper at the back but I can pull it on and off without opening it so I figured that I could leave that bit out. I made a wearable muslin to begin with, with some fabric I bought in Walthamstow market years ago. I think I bought about five metres at the time because it was so cheap! I’m amazed to have got to the end of it. Once I made it I realised it needed to be reduced by about an inch at the front and back so I just stitched a seam at the centre front and back and pressed it in. Still looked ok! I’m hiding the front seam under a corsage in this pic. Am really pleased with this pattern though – I could remake it again and again and it’s going to come in very handy for Self Stitched September. I think I’ll use my jumping bunnies fabric from FabricTales.com for the next version. In other news my little baby Gracie hasn’t been feeling well. She was sick on Thursday night and not herself at all on Friday. 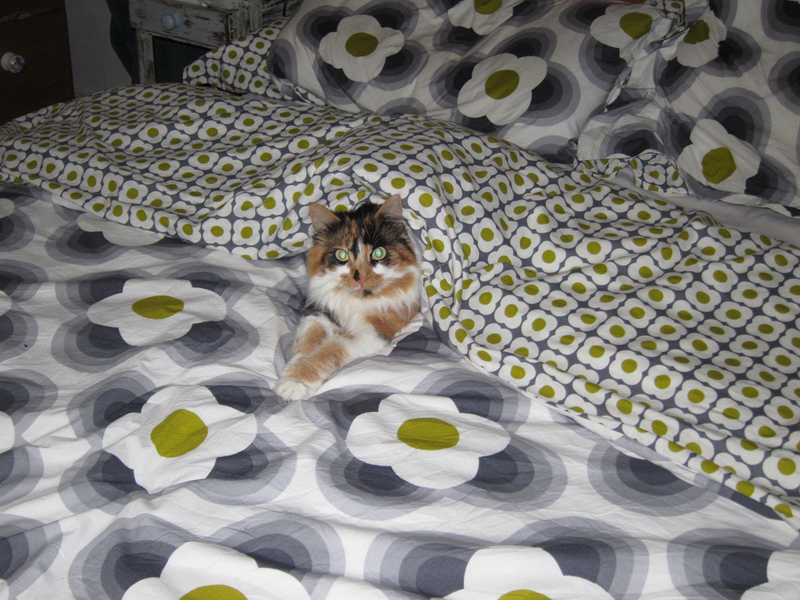 She’s usually so chatty (I know – cats can’t really talk but this one witters all day – I just can’t understand what she’s saying) but she was so quiet and just lying very still, it broke our hearts to see her like that. So we took her to the vet on Saturday where she had a thermometer put up her bottom. She had a bit of a temperature so the vet has given her an antibiotic and we’re to feed her just cooked chicken once a day until she’s better. Keef isn’t too happy about the lack of biscuits in his bowl but he’s putting up with it for his sister’s sake. Here’s the patient having a wee lie down. Awh! I wanted to approach this project as calmly and methodically as I could, for there to be no silly mistakes and no raging tantrums. And guess what – there weren’t! I carefully traced all the pattern pieces onto Swiss tracing paper/material. 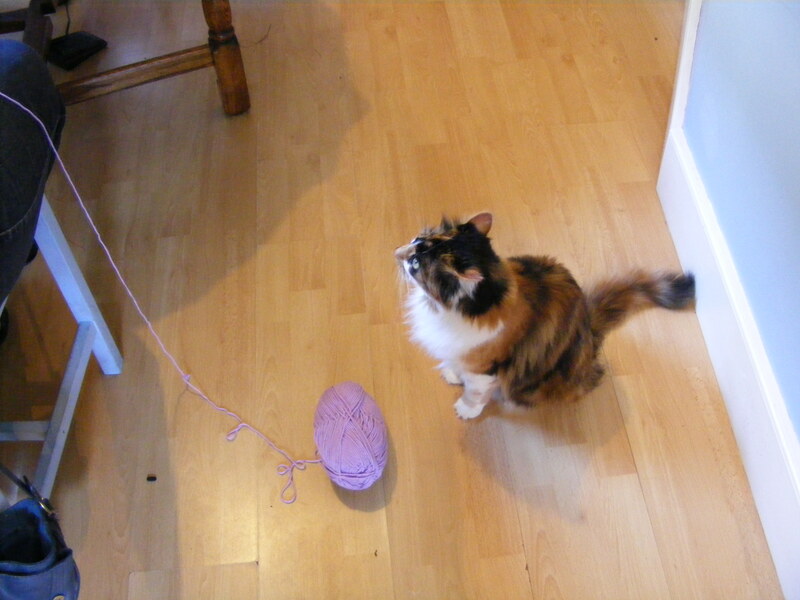 That took a whole evening but was so worth it as I now have a virtually rip-proof (read: cat proof) version of the pattern in my size. Another evening was spent cutting out all the pieces – so many pieces! I was quite bedazzled by it all. But I was being zen, remember? So I took it in my stride. A third evening (or was it Saturday morning at this stage?) was spent preparing the lining and facing and joining the two. And I finally managed to put the whole thing together on Monday night, with just a few adjustments to make on Tuesday. In all, it was a really lovely project to do and I’m so pleased with the result. 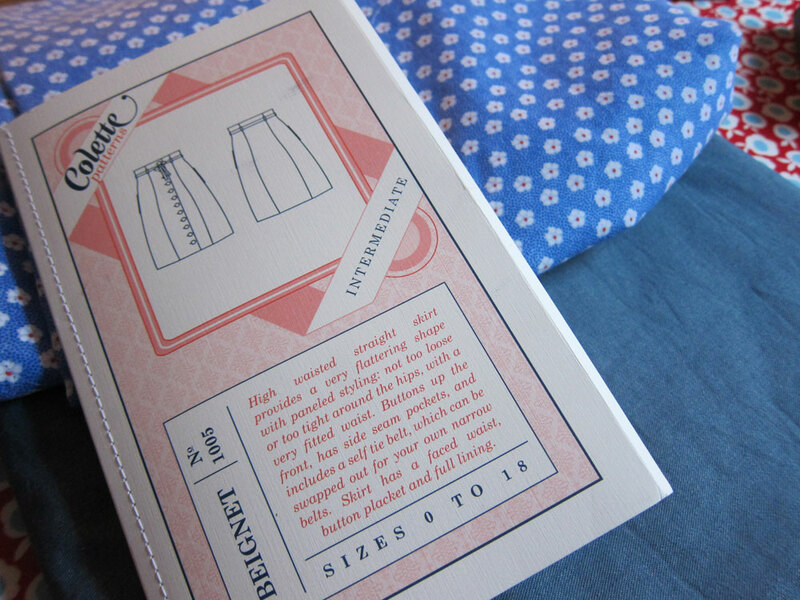 I love the little pockets and the neatness of the facing/lining combo inside – what a lovely stylish touch on the part of Colette patterns. In terms of slip ups or issues – there weren’t many although I could NOT for the life of me understand the concept of understitching the facing. I read through the notes on the pattern twenty times, I looked it up and found a fantastic tute on the Colette patterns website. Nada. I just couldn’t translate what I was seeing on the tute to my skirt, so I decided not to risk it. 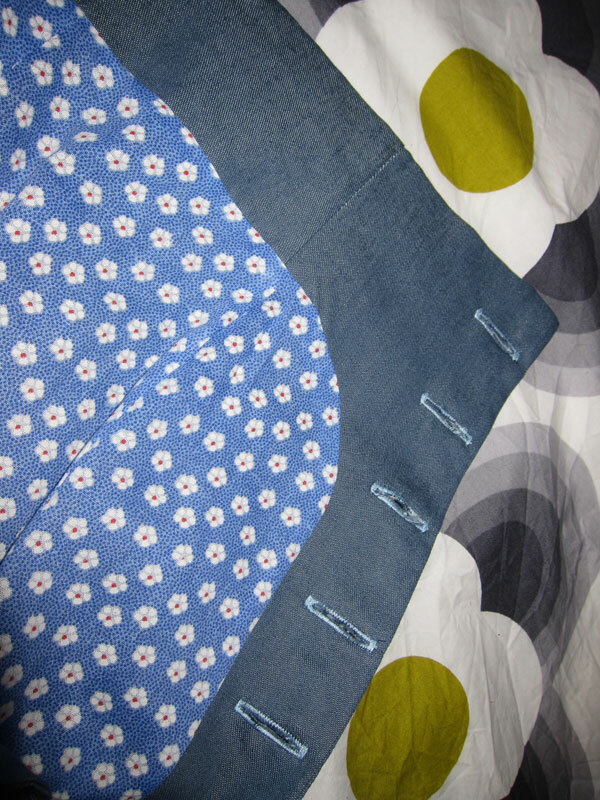 I also tried and failed to turn my denim belt loops the right side out using the needle method. 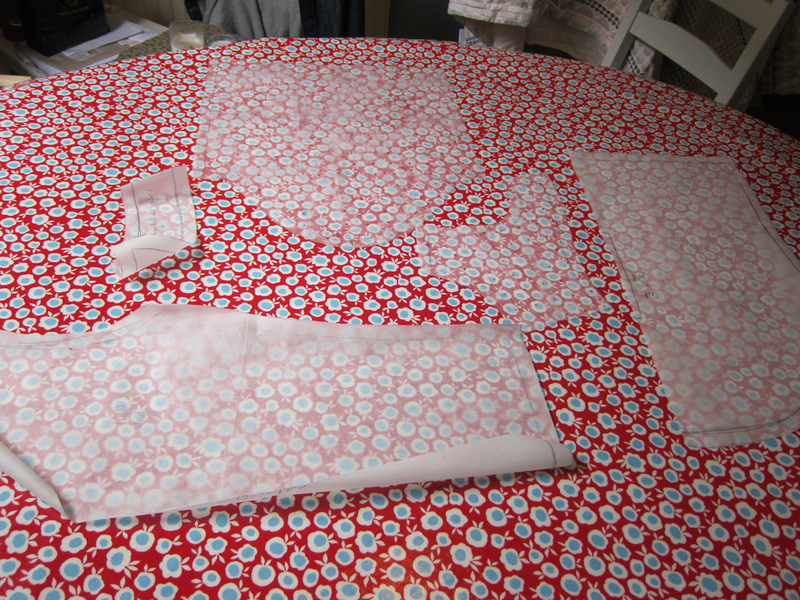 Oh god – what a horrible little task – I gave up after a while. I’ll attempt it at some point in the future. 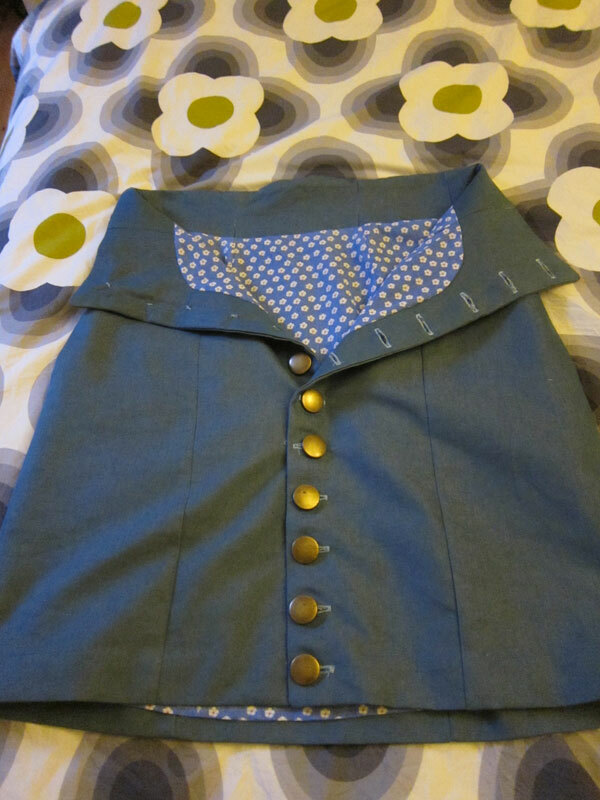 Fit wise – it was a little bulky round the waist and hips so I just repositioned the buttons to pull it in a little. I see myself wearing this skirt a lot and I can’t wait to make another version. Yay the Zen-im Beignet! Disclaimer: Frizzy hair day and v. tired from work – sorry for fairly lacklustre appearance! I’ve promised the nephew a pair of jazzy pyjama bottoms. 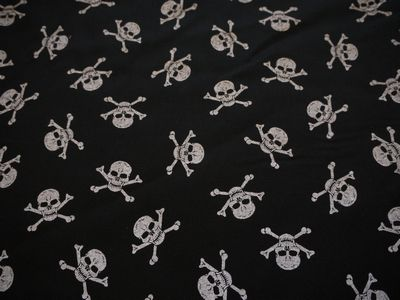 He’s obsessed with pirates so I’ve found this fabulous skull and cross bones fabric online for a bargain 3.50/metre. The husband has put in a personal request for pyjama bottoms of his own – so maybe we’ll see a spot of male modelling here next month! 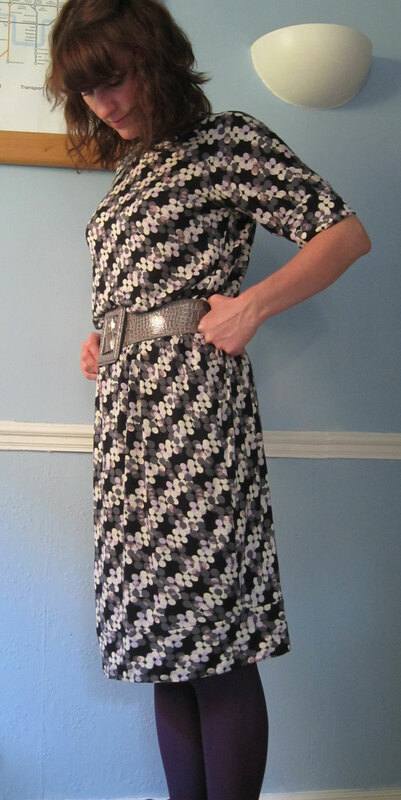 I’ve been looking for a suitable fabric to make my McCall’s M2401 dress. Thinking it will be an Autumn outfit so a rich floral might be nice. 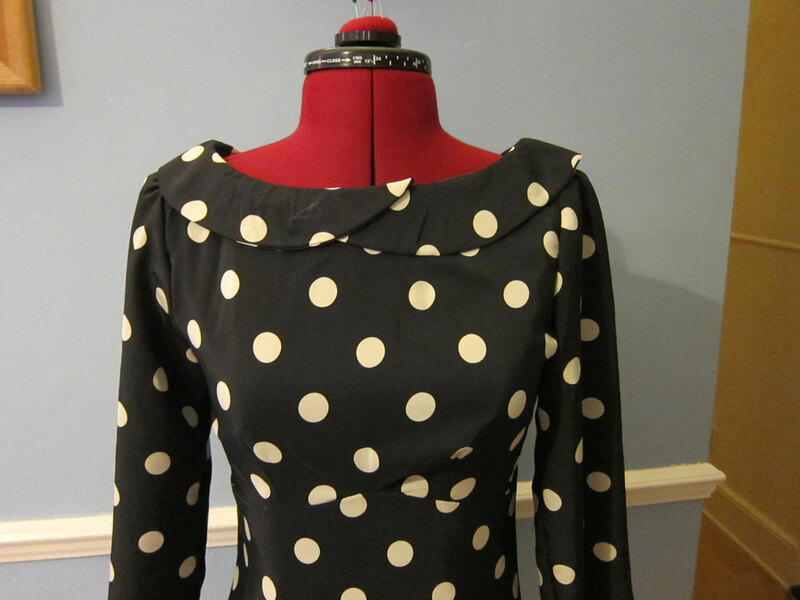 Or maybe I revert to type and go for polka dot – again! I’m getting so excited about finishing my Beignet that I’m already planning another one. 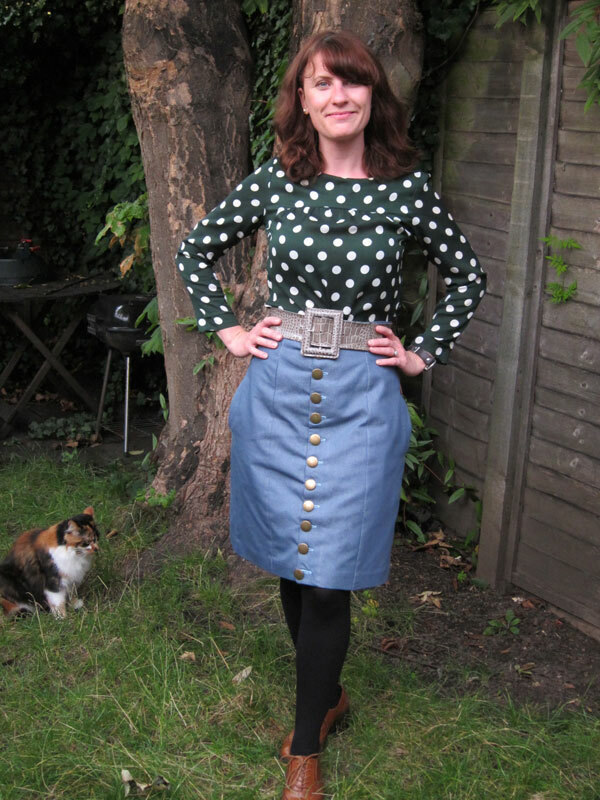 I’ve been inspired by Tilly’s gorgeous Banana Sweetie Skirt and would love to do a corduroy version of my own. 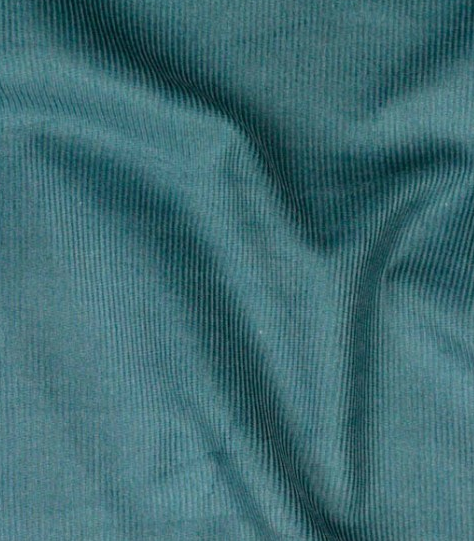 Maybe a lovely teal with a hot pink satin lining and covered buttons. One thing’s for sure. I have a LOT of sewing to get through if I have anywhere near enough items for Self-Stitched-September. I’d better get cracking! 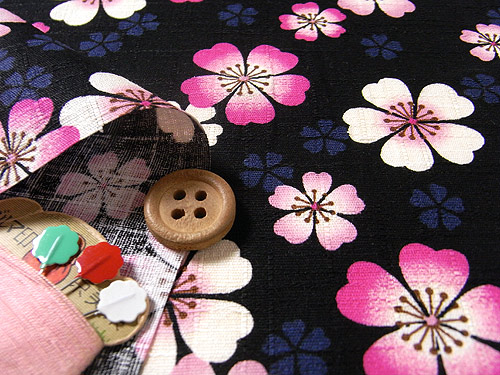 Hello sewing peeps, and how are you on this marvellous drizzly evening (in London at least)? At the moment it feels like summer is never going to come back but that’s not going to stop me from hoping. I’m an optimistic sort of person (some might say stubborn) which is probably why I came home from work tonight, rolled up my sleeves and gave the Frankenstein polka dot what for. I was determined to get a collar and some sleeves on that monster. But you know what? It bit back. 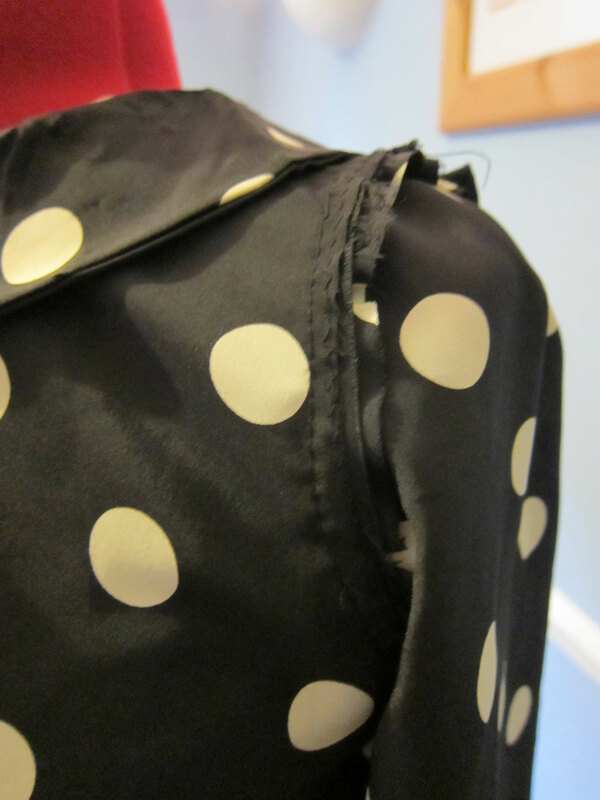 Yes, you’re wondering “Is that sleeve seam on the wrong side…or…?” I’m ashamed to say it is. Warning: This is what happens when you have little or no experience of sewing from scratch and are too impatient to check you’re doing it correctly. I’m sure this has never happened to any of you, but if you have a similar story to share then it might make me feel better! …and look at the state of it from behind. Eurgh. Run children! 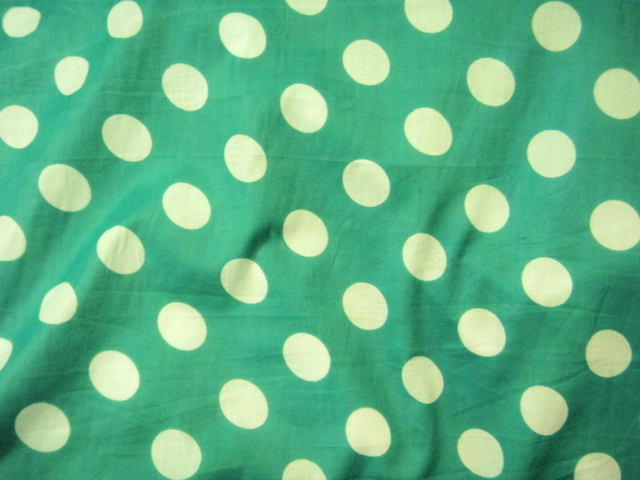 Run for your lives from the Frankenstein polka dot! 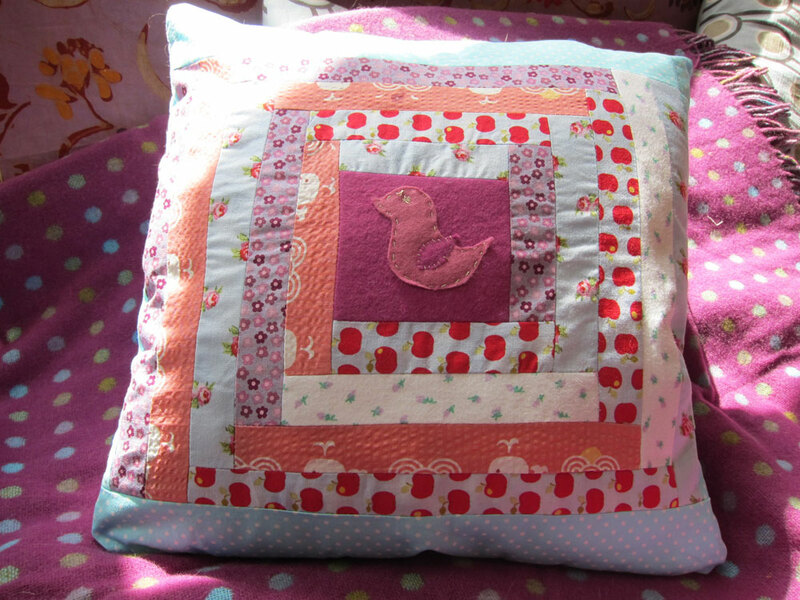 Finally, my (almost) 12 year old niece Hannah has been hinting that she’d like a hand-made gift for her birthday coming up soon, so I’ve knocked her up a log cabin patchwork cushion. It’s my first patchwork cushion as well as my first cushion using a zip rather than an envelope opening so bit of a learning curve. Here we are. It was a bit weird putting tights on, on such a lovely day. But in the interests of complete transparency (which this blog is all about ) I dutifully got the opaques out and the husband inside and got to work. 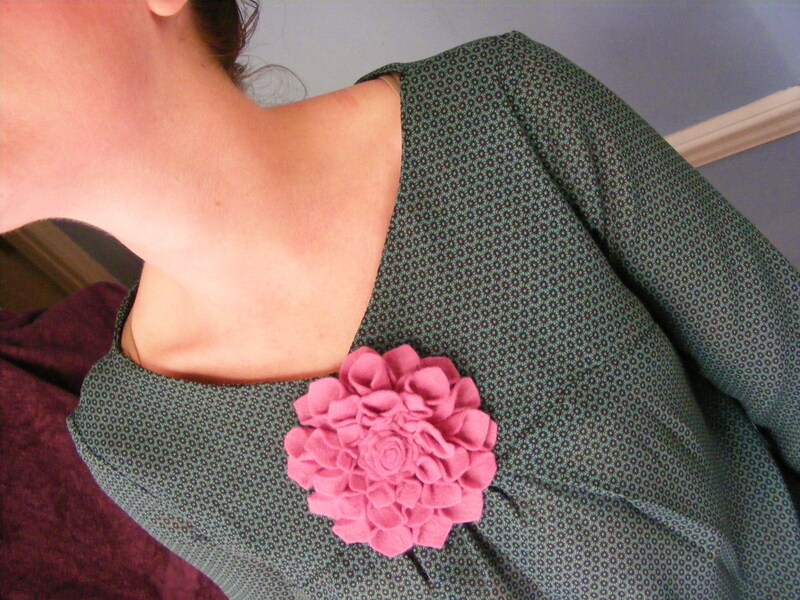 So here’s the Slouchy Autumn Berries Dress (pattern is HP 1090) – on a real live person. Truth be told I was a bit worried about this dress. I wasn’t sure it was really me – I was concerned it might look too staid and a bit yummy mummy. But I think as long as I give it a bit of attitooood then I might be alright! Next up – I’m going to finish the Frankenstein Polkadot this week if it kills me and then I’m going to cut out for my first Colette Beignet. I’m extremely excited about this skirt! Does anyone know of a good sewalong for the Beignet? I’ve been googling but haven’t found one. 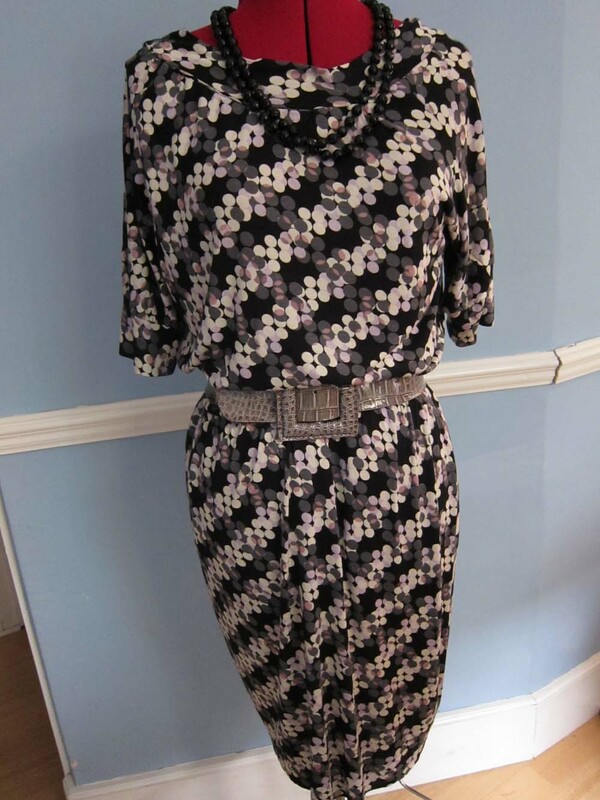 I’ve also ordered the Rooibos Dress pattern from Colette Patterns – hooray! I think I’ll be too late to do the sewalong but it will all be there for great reference once I’m ready. 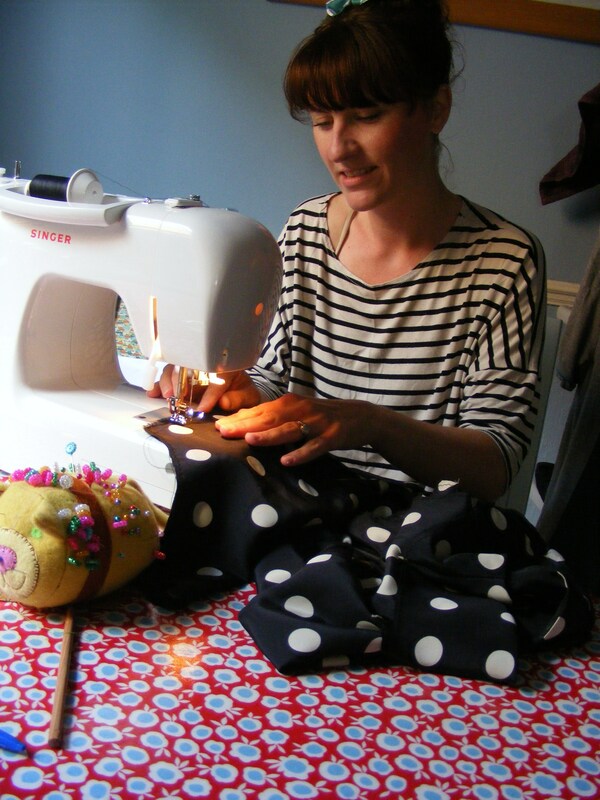 Plus I can be a bit of a cheat and watch everyone else before I select my fabric – it’s a win-win! 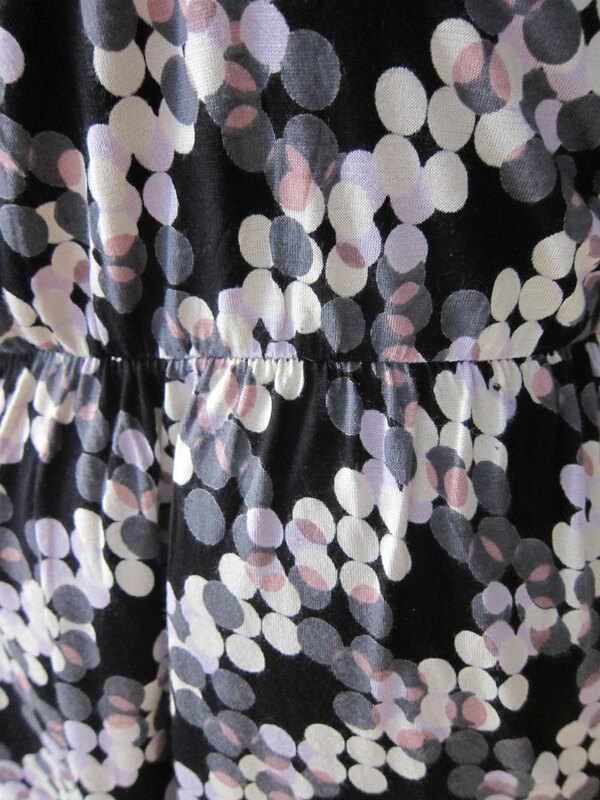 Disclaimer: There are no berries on this dress. But there’s a repetitious spot sort of pattern, which if you squint your eyes looks a bit like fallen berries. 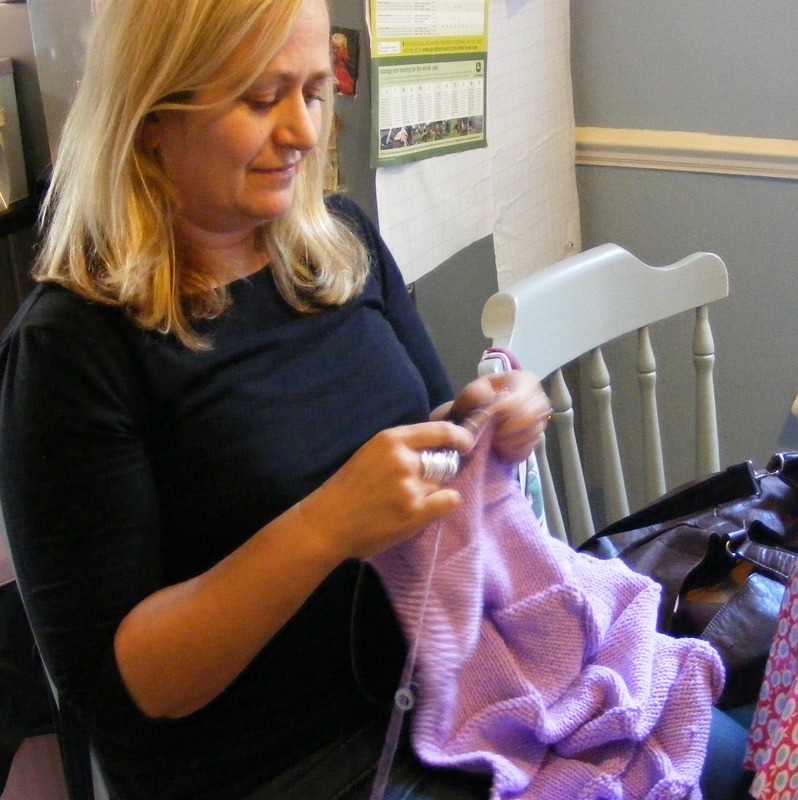 And autumn is beckoning, and knits are great for autumn. So… um… there we are! 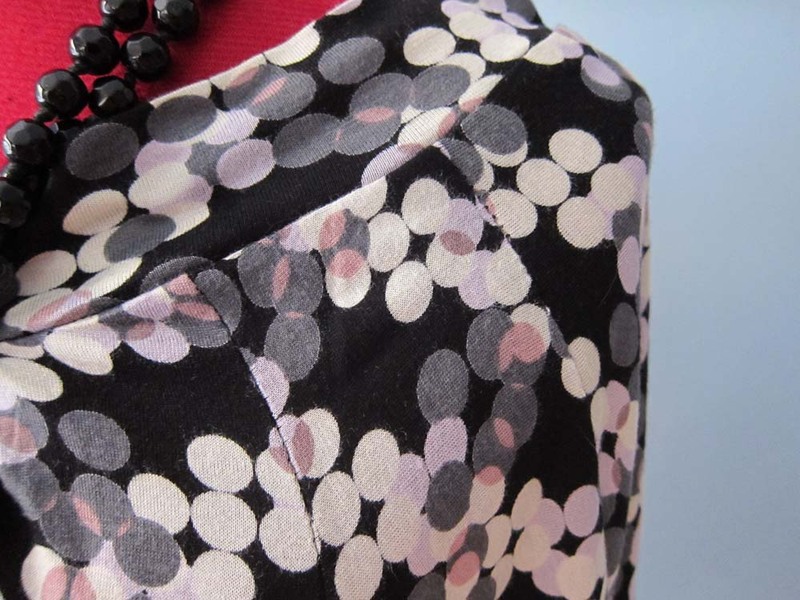 Compared with the Whale of a Time Blouse and the Frankenstein Polkadot, this pattern is a walk in the park… but not without its own particular difficulties. I’m working with a knit for the first time so that’s a bit of a stress, plus it’s a slippery fine sort of knit which has a tendency to slide around when I’m lining up raw edges and pinning… grrr. I’ve been experimenting with different stitches on this dress. Most experts seem to recommend a serger (or overlocker) for working with knits (as a stretchy fabric needs a stretchy seam), which I don’t have. So part of the dress (the raglan sleeves and the neckline) is sewn together with a straight stitch and by stretching the fabric on either side of the needle. 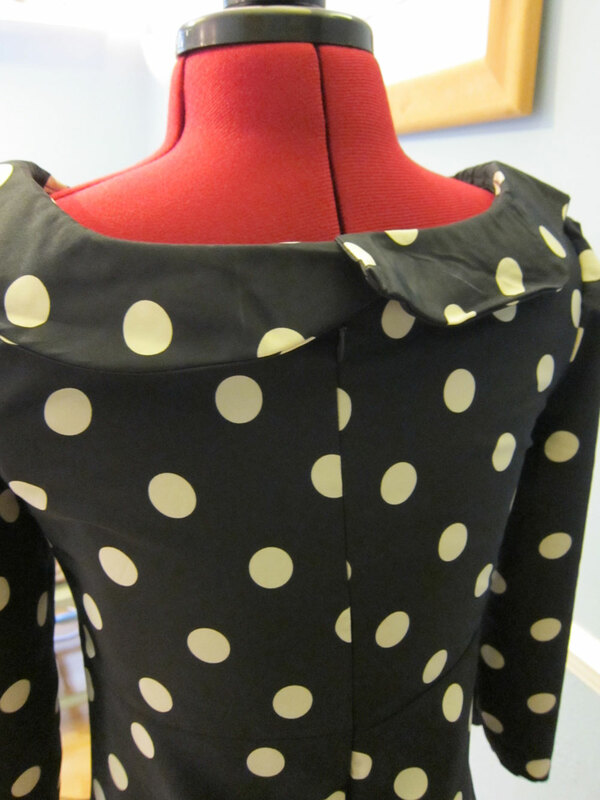 The other part (the waist and what will be the ribbed hem) is sewn with a zigzag and no stretching of the fabric. Both seem to provide the stretchy seams but I think I prefer the zigzag. It feels sturdier and looks neater on the underside, plus I feel like I have more control over the material. I had to unpick the waist and do it again as I made a bit of a hash of it first time, sewing the bodice and the skirt together and then adding the elastic which seemed to mess it up and give me two lines of stitches. After watching one of the rather fabulous and tremendously helpful videos on the Hot Patterns website, I decided to follow their tip of sewing both in one go. A massive improvement and much neater on the inside as well as outside. I’m slightly worried it looks a bit mumsy on the dress form, but perhaps once I add the hem and team it with coloured tights and ankle boots it’ll rough it up a bit. 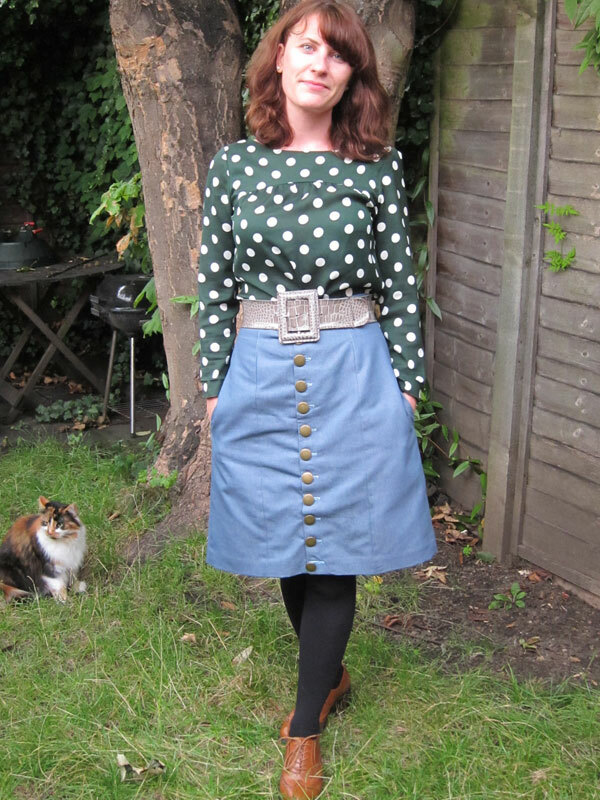 Excuse the rather old and crusty belt on there – just wanted to see how it looked! 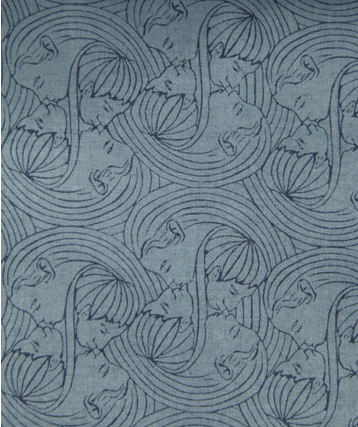 What I like most about this fabric is that it’s very forgiving. 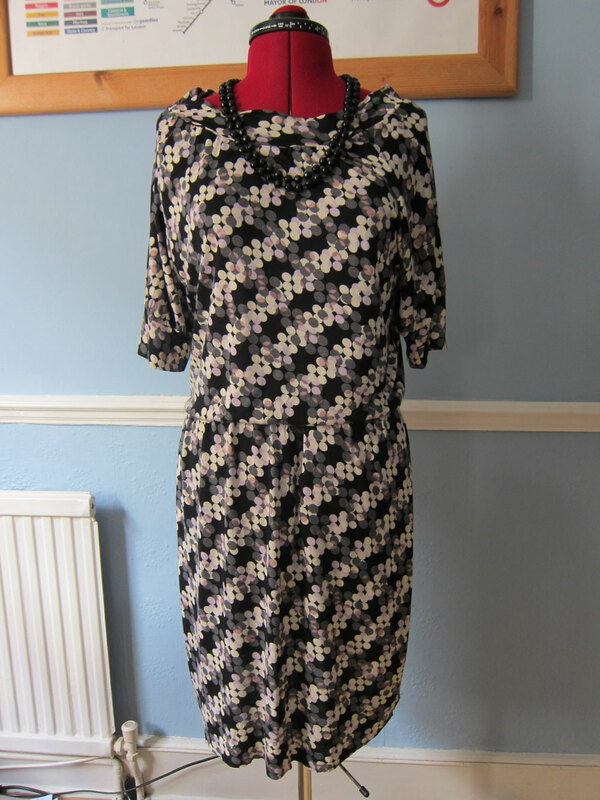 There are a few mistakes around the neckline but I decided to leave them in rather than redo them as it’s fairly hard to notice them without really close inspection. I reckon I could definitely use the bodice and sleeves pattern pieces to make more casual tops too. Yay. Although let’s not get too excited. We have yet to try it on properly!